Our Southern Saver Card Program is coming to a Southern Convenience store near you very soon! Read below for the details! Save Time, Save Money, Earn Rewards! With one of our southern saver cards, you can save money at the pump and find yourself eligible for big savings in the store, too! We appreciate your loyalty to Southern Convenience. Why not reward yourself for choosing us? Signing up is free and simple! Our Southern Saver Card will let you accumulate points that you can use for discounts and special offers, but you can enjoy instant gratification with exclusive, card-only discounts in store and at the pump. Loyalty discounts and clubs will help you budget every buck, and you’ll love the rewards! Tying your Southern Saver Card to your checking account opens up even greater discounts on fuel. For the first 60 days, we’ll knock $0.20 off per gallon! After 60 days, you will still save $0.10 per gallon, just by using our Southern Saver Card instead of your standard debit card. * Discounts while you earn points; that’s some serious kickback! Swing in your local store today and get signed up. It only takes a couple of minutes to get you on the track to saving time and money! 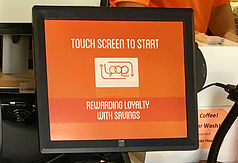 You can use the in-store kiosk, or ask an associate for details. *Subject to approval. Certain restrictions apply. Ask in-store for more information and disclosures.